2005-12-21 Assigned to BIOSENSORS INTERNATIONAL GROUP, LTD. reassignment BIOSENSORS INTERNATIONAL GROUP, LTD. CHANGE OF NAME (SEE DOCUMENT FOR DETAILS). Assignors: SUN BIOMEDICAL LTD.
An intravascular stent and method for inhibiting restenosis, following vascular injury, is disclosed. The stent has an expandable, linked-filament body and a drug-release coating formed on the stent-body filaments, for contacting the vessel injury site when the stent is placed in-situ in an expanded condition. The coating releases, for a period of at least 4 weeks, a restenosis-inhibiting amount of the macrocyclic triene immunosuppressive compound everolimus. The stent, when used to treat a vascular injury, gives good protection against clinical restenosis, even when the extent of vascular injury involves vessel overstretching by more than 30% diameter. Also disclosed is a stent having a drug-release coating composed of (i) 10 and 60 weight percent poly-dl-lactide polymer substrate and (ii) 40–90 weight percent of an anti-restenosis compound, and a polymer undercoat having a thickness of between 1–5 microns. This application is a continuation-in-part of U.S. application Ser. No. 10/133,814 filed Apr. 24, 2002, now U.S. Pat. No. 6,939,376, incorporated herein by reference. The present invention relates to an endovascular drug-delivery stent and to a method for treating restenosis. Heparin, as well as other anti-platelet or anti-thrombolytic surface coatings, are known which are chemically bound to the surface of the stent to reduce thrombosis. A heparinized surface is known to interfere with the blood-clotting cascade in humans, preventing attachment of platelets (a precursor to thrombin) on the stent surface. Stents have been described which include both a heparin surface and an active agent stored inside of a coating (see U.S. Pat. Nos. 6,231,600 and 5,288,711, for example). A variety of agents specifically claimed to inhibit smooth muscle-cell proliferation, and thus inhibit restenosis, have been proposed for release from endovascular stents. As examples, U.S. Pat. No. 6,159,488 describes the use of a quinazolinone derivative; U.S. Pat. No. 6,171,609, the use of taxol, and U.S. Pat. No. 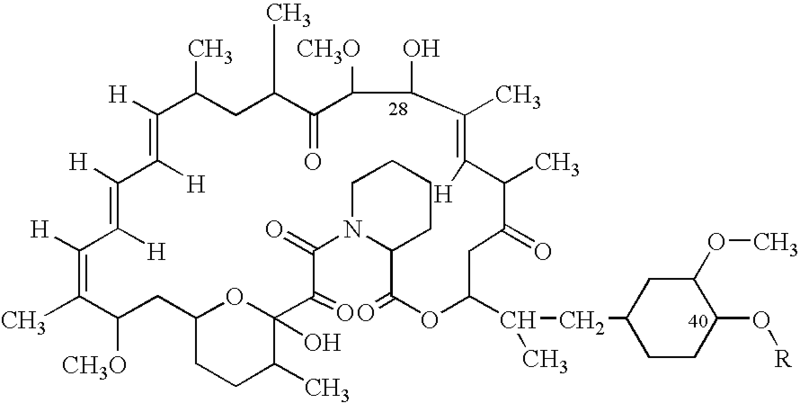 5,176,98, the use of paclitaxel, a cytotoxic agent thought to be the active ingredient in the agent taxol. The metal silver is cited in U.S. Pat. No. 5,873,904. Tranilast, a membrane stabilizing agent thought to have anti-inflammatory properties is disclosed in U.S. Pat. No. 5,733,327. Ideally, a compound selected for inhibiting restenosis, by drug release from a stent, should have three properties. First, because the stent should have a low profile, meaning a thin polymer matrix, the compound should be sufficiently active to produce a continuous therapeutic dose for a minimum period of 4–8 weeks when released from a thin polymer coating. Secondly, the compound should be effective, at a low dose, in inhibiting smooth muscle cell proliferation. Finally, endothelial cells which line the inside surface of the vessel lumen are normally damaged by the process of angioplasty and/or stenting. The compound should allow for regrowth of endothelial cells inside the vessel lumen, to provide a return to vessel homeostasis and to promote normal and critical interactions between the vessel walls and blood flowing through the vessel. In one embodiment, the stent body is a metal-filament structure, and the polymer substrate in the coating is selected from the group consisting of polymethylmethacrylate, ethylene vinyl alcohol, poly-lactide polymers, ε-caprolactone, ethyl vinyl acetate, polyvinyl alcohol, and polyethylene oxide. In one preferred embodiment, the polymer substrate in the coating is formed of poly-dl-lactide having a thickness between 3–20 microns and the compound is present in the coating at an initial concentration of between 35 and 80 weight percent of coating. In another embodiment, the stent for use in the method further includes a polymer undercoat disposed between the filaments of the stent body and the drug-release coating. Exemplary polymers for the undercoat include ethylene vinyl alcohol, parylast, silicone, a fluoropolymer, and parylene. In an exemplary stent, a parylene polymer undercoat having a thickness of between 1–3 microns is deposited, the underlayer disposed between the filaments of the stent body and a poly-dl-lactide coating substrate. The compound can be present in the coating in an amount between 50% and 75% by weight. In a preferred embodiment, the drug release coating has a drug-to-polymer ratio of 54% drug and 46% polymer by weight. In another embodiment, the compound is carried on the stent in a drug-release coating composed of a polymer substrate and having between 30–80 weight percent of the compound. In one embodiment of this aspect, the stent body is a metal-filament structure, and the polymer substrate in the coating is selected from the group consisting of polymethylmethacrylate, ethylene vinyl alcohol, poly-lactide polymers, ε-caprolactone, ethyl vinyl acetate, polyvinyl alcohol, and polyethylene oxide. In one exemplary embodiment, the polymer substrate in the coating is formed of poly-dl-lactide having a thickness between 3–20 microns and the compound is present in the coating at an initial concentration of between 35 and 80 weight percent of coating. The stent, in another embodiment, includes a parylene polymer undercoat having a thickness of between 1–3 microns, disposed between the filaments of the stent body and a poly-dl-lactide coating substrate. In this embodiment, the compound can be present at an initial concentration of between 50 and 75 weight percent of coating. More generally, the stent can comprise a polymer undercoat disposed between the filaments of the stent body and said drug-release coating. Exemplary materials for the polymer undercoat include ethylene vinyl alcohol, parylast, silicone, a fluoropolymer, and parylene. In the embodiment shown, the stent body is formed of a plurality of linked tubular members by filaments, such as members 24, 26. Each member has an expandable zig-zag, sawtooth, or sinusoidal wave structure. The members are linked by axial links, such as links 28, 30 joining the peaks and troughs of adjacent members. As can be appreciated, this construction allows the stent to be expanded from a contracted condition, shown in FIG. 1, to an expanded condition, shown in FIG. 2, with little or no change in the length of the stent. At the same time, the relatively infrequent links between peaks and troughs of adjacent tubular members allows the stent to accommodate bending. This feature may be particularly important when the stent is being delivered to a vascular site in its contracted state, in or on a catheter. The stent has a typical contracted-state diameter (FIG. 1) of between 0.5–2 mm, more preferably 0.71 to 1.65 mm, and a length of between 5–100 mm. In its expanded state, shown in FIG. 2, the stent diameter is at least twice and up to 8–9 times that of the stent in its contracted state. Thus, a stent with a contracted diameter of between 0.7 to 1.5 mm may expand radially to a selected expanded state of between 2–8 mm or more. According to an important feature of the invention, the stent filaments are coated with a drug-release coating composed of a polymer matrix and an anti-restenosis compound (active compound) distributed within the matrix for release from the stent over an at least a several week period, typically 4–8 weeks, and optionally over a 2–3-month period or more. Also shown in FIG. 3 is a polymer underlayer 34 disposed between the stent filament and the coating. The purpose of the underlayer is to help bond the coating to the stent-body filaments, that is, to help stabilize the coating on the filaments. As will be seen below, this function is particularly valuable where the coating is formed of a polymer substrate containing a high percentage of anti-restenosis compound, e.g. between 35–80 weight percent compound. One exemplary underlayer polymer is parylene, and in one embodiment parylene is used in conjunction with a polymer substrate formed of bioerodable (poly-dl-lactide). Other suitable polymer underlayers are ethylene vinyl alcohol (EVOH), paryLAST™, silicone, TEFLON™ and other fluoropolymers, that may be deposited on the metal stent surfaces by plasma-coating or other coating or deposition processes. The underlayer has a typical thickness between 1–5 microns. The polymer forming the substrate may be any biocompatible polymer material from which entrapped compound can be released by diffusion and/or released by erosion of the polymer matrix. Two well-known non-erodable polymers for the coating substrate are polymethylmethacrylate and ethylene vinyl alcohol. Methods for preparing these polymers in a form suitable for application to a stent body are described for example, in US 2001/0027340A1 and WO00145763A1, incorporated herein by reference. In general, the limit of drug addition to the polymers is about in the range of 20–40 weight percent. Bioerodable polymers, particularly poly-dl-lactide polymer, are also suitable for coating substrate material. In one general embodiment, of the invention, the coating is a bioerodable poly-dl-lactide polymer substrate, i.e., poly-dl-lactic acid polymer, that may contain up to 80% by dry weight of the active compound distributed within the polymer substrate. More generally, the coating contains 35–80% dry weight active compound and 20–65% percent by dry weight of the polymer. Exemplary coatings include 25–50% dry weight polymer matrix and 50–75 weight percent active compound. The polymer is formulated with the active compound for deposition on the stent filaments as detailed in Section II below. One preferred coating is formed of 25–50 weight percent poly-dl-lactide polymer substrate, and 50–75 weight percent macrocyclic triene immunosuppressant compound, having a coating thickness of between 3–15 microns. The underlayer is formed of parylene, and has a thickness between 1–5 microns. This embodiment typically contains an amount of compound equal to about 15 micrograms drug/mm of stent length. In another exemplary embodiment, the coating is formed of 15–35 weight percent of an erodable or non-erodable polymer substrate, and 65–85 weight percent of the macrocyclic triene compound. The coating thickness is preferably 10–30 microns, and the stent may include a 1–5 micron polymer underlayer, e.g., parylene underlayer. This embodiment typically contains an amount of compound equal to about 15 micrograms drug/mm of stent length. FIG. 4 shows a cross section of a filament, e.g., helical ribbon, in a bioerodable stent of the type just described, having separately formed polymer body and coating. The figure shows an internal polymer stent filament 36 coated on all sides with a bioerodable coating 38. An exemplary coating is formed of poly-dl-lactide and contains between 20–40 weight percent anti-restenosis drug, such as the macrocyclic triene immunosuppressant compound everolimus, and 60–80 weight percent polymer substrate. In another general embodiment, the coating contains 45–75 weight percent compound, and 25–55 weight percent polymer matrix. Other types of anti-restenosis compounds, such as listed above, may be employed in either embodiment. The X-Y-Z positioning table and moveable support may be purchased from I&J Fisnar. The solution delivery tube preferred dimensions are preferably between 18–28 gauge stainless steel hypotubes mounted to a suitable locking connector. Such delivery tubes may be obtained from EFD Inc of East Providence, R.I. See EFD's selection guide for Special Purpose Tips. The preferred tips are reorder #'s 5118-1/4-B through 5121-1/4-B “Burr-free passivated stainless steel tips with ¼″ length for fast point-to-point dispensing of particle-filled or thick materials”, reorder #'s 51150VAL-B “Oval stainless steel tips apply thick pastes, sealants, and epoxies in flat ribbon deposits”, and reorder #'s 5121-TLC-B through 5125-TLC-B “Resists clogging of cyanoacrylates and provides additional deposit control for low viscosity fluids. Crimped and Teflon lined”. A disposable pressurizable solution reservoir is also available from EFD, stock number 1000Y5148 through 1000Y 5152F. An alternate tip for use with the invention is a glass micro-capillary with an I.D. of about 0.0005 to 0.002 inch, such as about 0.001 inch, which is available from VWR Catalog No. 15401-560 “Microhematocrit Tubes”, 60 mm length, I.D. 0.5–0.6 mm. Typically, as described above, the coating is applied directly onto the outside support surface(s) of the stent, and may or may not cover the entire or a portion(s) of the inside surface(s) of the stent depending on how control is applied to the above described coating system of the present invention, as illustrated in FIGS. 5A and 5B. The latter figure shows application of a coating material 52 to top and side regions of a filament 50. Alternatively, the coating or coating mixture can also be applied directly onto the inside surface of the stent. A thin delivery tip may penetrate through one or more of the cut out areas (i.e. windows) in the wall of the stent structure, and thereby apply the coating mixture directly onto the inside surfaces at desired areas. In this method, it is possible to apply different coating materials having different drug components to outer and inner sides of the filaments. For example, the coating on the outer filament surfaces could contain an anti-restenosis compound, and the coating of the inner filament surfaces, one of the above secondary agents, such an anti-thrombotic or anti-clotting compound. If the stent has a large enough diameter, a thin “L-shaped” delivery tip can be inserted into the stent open ends along the longitudinal axis of the stent for the purpose of applying coating to the inside surfaces. The polymer for use in the invention includes, but is not limited to, poly(d,l-lactic acid), poly(l-lactic acid), poly(d-lactic acid), ethylene vinyl alcohol (EVOH), e-caprolactone, ethylvinyl hydroxylated acetate (EVA), polyvinyl alcohol (PVA), polyethylene oxides (PEO), and co-polymers thereof and mixtures thereof, dissolved in a suitable solvent or solvent mixture Exemplary solvents include chloroform, ethyl acetate, acetone, and the like, and mixtures of these solvents. These polymers all have a history of safe and low inflammatory use in the systemic circulation. As noted above, a secondary agent may be incorporated into the polymer mixture. As an example, heparin in crystalline form may be incorporated into the coating. The heparin crystals are micronized to a particle size of approximately 1–5 microns and added in suspension to the polymer solution. Suitable forms of heparin are those of crystalline form that exhibit bioactivity in mammalian hosts when applied according to the process of the invention, including heparin salts (i.e. sodium heparin and low molecular weight forms of heparin and their salts). Upon deployment of the drug delivering stent 62 into vessel wall 60, as seen in FIG. 7, the heparin crystals near the surface of the coating of cured polymer 66 begin to dissolve, increasing the porosity of the polymer. As the polymer slowly dissolves, more heparin and bioactive agent are released in a controlled manner, as indicated by arrows 68. Where it is desired to form a coating with a high drug/polymer substrate ratio, e.g., where the drug constitutes 40–80 weight percent of the coating on a metal stent substrate, it is advantageous to form an underlayer on the stent filaments to stabilize and firmly attach the coating to the substrate. The underlayer may be further processed, prior to deposition of the coating material, by swelling in a suitable solvent, e.g., acetone, chloroform, ethyl acetate, xylene, or mixtures thereof. This approach is described in Example 5 for preparing a stent having a high ratio of everolimus to poly-dl-lactide. Here a parylene underlayer is formed on the stent filaments by plasma deposition, and the underlayer then allowed to swell in xylene prior to final deposition of the coating material. The method was effective in producing coating containing 50% drug in one case and 75% drug in another case in a poly-dl-lactide polymer substrate, in a coating having a thickness of only 5–10 microns. FIG. 6B shows drug release of everolimus from coatings of the present invention on metal stent substrates. The upper set of curves show drug release where the coating has been applied directly to the metal surface. The lower set of curves (showing slower release) were obtained by applying an underlayer or primer coat of parylene to the metal stent surface, followed by coating of the surface with the coating system of the invention. As seen, the primer increases the mechanical adhesion of the coating to the sent surface, resulting in slower breakdown of the bioerodeable coating and slower release of drug. Such a configuration is useful where it desired to have a strongly attached stent coating which can withstand repeated abrasions during tortuous maneuvering of the drug eluting stent inside the guide catheter and/or vessel, and/or where it is desired to slow down the drug release for extended treatment of the athersclerosis disease process at the implant site following implantation of the device. Trials in a swine restenosis animal model as generally described by Schwartz et al. (“Restenosis After Balloon Angioplasty-A Practical Proliferative Model in Porcine Coronary Arteries”, Circulation 82:(6) 2190–2200, December 1990.) demonstrate the ability of the stent of this invention to limit the extent of restenosis, and the advantages of the stent over currently proposed and tested stents, particularly in cases of severe vascular injury, i.e., greater than 35% vessel stretching. The studies are summarized in Example 4. FIGS. 8A–8C are examples of stent cross-sections of neointimal formation at 28 days in a bare metal S-Stent (available from Biosensors International Inc, Newport Beach, Calif.). FIGS. 9A–9C are examples of neointimal formation in a polymer-coated (no drug) S-Stent; and FIGS. 10A–10C and 11A–11C of neointimal formation in everolimus/polymer coated stents. In general, the vessels with everolimus-coated stent treatment appeared to be well-healed with a well established endothelial layer, evidence of complete healing and vessel homeostasis at 28 days. FIG. 12 is an example of vessel cross-section at 91× magnification showing healing and establishment of an endothelial layer on the inside of the vessel lumen at 28 days post implant. From the foregoing, it can be seen how various objects and features of the invention are met. In one aspect, the invention provides a bioerodable stent coating with high drug/polymer ratios, e.g., 40–80% drug by weight. This feature allows continuous delivery of an anti-restenosis compound over an extended period from a low-profile stent. At the same time, the total amount of polymer breakdown components such as lactide and lactic acid released during bioerosion is relatively small, minimizing possible side effects, such as irritation, that may result from bioerosion of the stent coating. STEP A. Synthesis of 2-(t-butyldimethylsilyl) oxyethanol(TBS glycol). 154 mL of dry THF and 1.88 g NaH are stirred under in a nitrogen atmosphere in a 500 mL round bottom flask condenser. 4.4 mL dry ethylene glycol are added into the flask, resulting in a large precipitate after 45 minutes of stirring. 11.8 g tert-butyldimethylsilyl chloride is added to the flask and vigorous stirring is continued for 45 minutes. The resulting mixture is poured into 950 mL ethylether. The ether is washed with 420 mL brine and solution is dried with sodium sulfate. The product is concentrated by evaporation of the ether in vacuo and purified by flash chromatography using a 27×5.75 cm column charged with silica gel using a hexanes/Et2O (75:25 v/v) solvent system. The product is stored at 0° C.
STEP B. Synthesis of 2-(t-butyldimethylsilyl)oxyethyl triflate (TBS glycol Trif). 4.22 g TBS glycol and 5.2 g 2,6-lutidine are combined in a double-necked 100 mL flask with condenser under nitrogen with vigorous stirring. 10.74 g of trifluoromethane sulfonic anhydride is added slowly to the flask over a period of 35–45 minutes to yield a yellowish-brown solution. The reaction is then quenched by adding 1 mL of brine, and the solution washed 5 times in 100 mL brine to a final pH value of between 6–7. The solution is dried using sodium sulfate, and concentrated by evaporation of the methylene chloride in vacuo. The product is purified using a flash chromatography column of approximately 24×3 cm packed with silica gel using hexane/Et2O (85:15 v/v) solvent system, then stored at 0° C.
STEP C. Synthesis of 40-O-[2-(t-butyldimethylsilyl)oxy]ethyl-rapamycin (TBS Rap). 400 mg rapamycin, 10 mL of toluene, and 1.9 mL 2,6-lutidine are combined and stirred in a 50 mL flask maintained at 55–57° C. In a separate 3 mL septum vial, 940 μL 2,6-lutidine is added to 1 mL toluene, followed by addition of 2.47 g TBS glycol Trif. The contents of the vial are added to the 50 mL flask and the reaction allowed to proceed for 1.5 hours with stirring. 480 μL 2,6-lutidine plus an additional 1.236 g TBS glycol Trif is added to the reaction flask. Stirring is continued for an additional hour. Finally, a second portion of 480 μL 2,6-lutidine and 1.236 g TBS glycol Trif is added to the mixture, and the mixture is allowed to stir for an additional 1–1.5 hours. The resulting brown solution is poured through a porous glass filter-using vacuum. The crystal like precipitate is washed with toluene until all color has been removed. The filtrate is then washed with 60 mL saturated NaHCO3 solution twice and then washed again with brine. The resulting solution is dried with sodium sulfate and concentrated in vacuo. A small quantity of a hexanes/EtOAc (40:60 v/v) solvent is used to dissolve the product, and purification is achieved using a 33×2 cm flash chromatography column packed with silica gel, and developed with the same solvent. The solvent is removed in vacuo and the product stored at 5° C.
STEP D. Synthesis Process of 40-O-(2-hydroxyl)ethyl-rapamycin (Everolimus). A pyrex glass dish (150×75 mm) is filled with ice and placed on a stirring plate. A small amount of water is added to provide an ice slurry. 60–65 mg of TBS-Rap is first dissolved in a glass vial by adding 8 mL methanol. 0.8 mL 1N HCl is added to the vial, the solution is stirred for 45 minutes and then neutralized by adding 3 mL aqueous saturated NaHCO3. 5 mL brine is added to the solution, followed with 20 mL EtoAc, resulting in the formation of two phases. After mixing of the phases, a separatory funnel is used to draw off the aqueous layer. The remaining solvent is washed with brine to a final pH of 6–7, and dried with sodium sulfate. The sodium sulfate is removed using a porous glass filter, and the solvent removed in vacuo. The resulting concentrate is dissolved in EtoAc/methanol (97:3) and then purified using in a 23×2 cm flash chromatography column packed with silica gel, and developed using the same solvent system. The solvent is removed in vacuo and the product stored at 5° C.
100 mg poly(dl-lactide) was dissolved into 2 mL acetone at room temperature. 5 mg everolimus was placed in a vial and 400 μL lactide solution added. A microprocessor-controlled syringe pump was used to precision dispense 10 μL of the drug containing lactide solution to the stent strut top surfaces. Evaporation of the solvent resulted in a uniform, drug containing single polymer layer on the stent. It was reasoned that the most challenging treatment condition for the drug eluting stent is a severely injured vessel, as it is known that the degree of restenosis (neointimal formation) increases directly with extent of vessel injury. Experiments were conducted in pigs, and a substantial number of the vessels which were the target of drug-coated stent implants were seriously injured (averaging approximately 36% overstretch injury of the vessel) using an angioplasty balloon. This caused severe tearing and stretching of the vessel's intimal and medial layers, resulting in exuberant restenosis at 28 days post implant. In this way, it was possible to assess the relative effectiveness of various dosings of drug, and drug to polymer weight ratios-on the same metal stent/polymer platform for reduction of restenosis at 28 days post-implant. The above data predict that with either the C-Ulow or C-Uhigh doses of everolimus will produce a 45–48% reduction in neointimal formation in a low to moderately injured vessel. Morphometric analysis is considered a highly accurate method of measuring in-stent restenosis in the pig coronary model. In the high injury model, the C-High formulation produced the lowest amounts of neointima formation in the ‘High Injury’ experiment at 28 days, however, the C-Uhigh had the highest injury score of the group, and still managed a very low % Area Stenosis of 0.45. Therefore, the data independently confirm the findings of the QCA analysis, and supports the choice of C-Uhigh as the preferred formulation for human trials. As-marketed metal corrugated-ring stents (“S-stent”, corrugated ring design, Biosensors Intl), 14.6 mm in length, were coated with an approximately 2 micron thick layer of parylene ‘C’ primer coating using a plasma deposition process. Parylene coated stents were placed in xylene overnight at ambient temperature. A stock poly(dl)-lactic acid solution containing 50 μg/μL polylactic acid (PDLA) was prepared by dissolving 100 mg PDLA in 2 mL acetone. 2. The method of claim 1, wherein the polymer substrate in the coating is formed of poly-dl-lactide having a thickness between 3–20 microns and said compound is present in the coating at an initial concentration of between 35 and 80 weight percent of coating. 3. The method of claim 1, wherein the stent further includes a polymer undercoat disposed between the filaments of the stent body and said drug-release coating. 4. The method of 3, wherein said polymer undercoat is formed of a polymer selected from the group consisting of ethylene vinyl alcohol, parylast, silicone, a fluoropolymer, and parylene. 5. The method of claim 2, wherein the stent further includes a parylene polymer undercoat having a thickness of between 1–3 microns, disposed between the filaments of the stent body and said poly-dl-lactide coating substrate. 6. The method of claim 5, wherein said compound is present in the coating in an amount between 50% and 75% by weight. 8. The stent of claim 7, wherein the polymer substrate in the coating is formed of poly-dl-lactide having a thickness between 3–20 microns and said compound is present in the coating at an initial concentration of between 35 and 80 weight percent of coating. 9. The stent of claim 8, which further includes a parylene polymer undercoat having a thickness of between 1–3 microns, disposed between the filaments of the stent body and said poly-dl-lactide coating substrate. 10. The stent of claim 8, wherein said coating includes the compound at an initial concentration of between 50 and 75 weight percent of coating. 11. The stent of claim 7, further comprising a polymer undercoat disposed between the filaments of the stent body and said drug-release coating. 12. The stent of claim 11, wherein said polymer undercoat is formed of a polymer selected from the group consisting of ethylene vinyl alcohol, parylast, silicone, a fluoropolymer, and parylene. 13. An apparatus for delivery of the stent according to claim 7, comprising a catheter with the stent. Denny, W.A. and Cain, B.F., Journal of Medicinal Chemistry 21(5):430-437, (1978). Ichihashi, T., et al., Pharmaceutical Research 11(4):508-512, (1994). Marx, S. et al., "Bench to bedside: the development of rapamycin and its application to stent restenosis", Circulation, 104:852-855 (2001). Nishimura, T. et al., "40-O-(2-hydroxyethyl)-rapamycin attenuates pulmonary arterial hypertension and neointimal formation in rats", American Journal of Critical Care and Respritory Medicine, 163(2):498-502 (2001). Schwartz et al. , "Restenosis After Balloon Angioplasty-A Practical Proliferative Model in Porcine Coronary Arteries", Circulation, 82:(6) 2190-2200 (1990.). Sousa, J.E. et al., "Lack of neointimal proliferation after implantation of sirolimus-coated stents in human coronary arteries: a quantitative coronary angiography and three-dimensional intravascular ultrasound study" Circulation, 103(2):192-195 (2001).